Confronted with sickness, captivity, and the testing of their friendship, Aang, Katara, and Sokka labour on with their journey to the Northern Water Tribe. Along the way, they encounter a master Firebender, and Aang tries firebending for the first time...with disasterous results. CHAPTER 13: THE BLUE SPIRIT Out on his own, Aang is captured and held prisoner by Admiral Zhao. But a mysterious man in the blue mask helps Aang escape! CHAPTER 14: THE FORTUNETELLER Aang, Katara, and Sokka meet a fortuneteller who can predict anything! The villagers become so reliant on her, they're blind to the imminent danger they are in. CHAPTER 15: BATO OF THE WATER TRIBE Sokka and Katara reunite with an old Water tribe friend. Feeling insecure, Aang intercepts and hides an important message from Katara and Sokka's father. 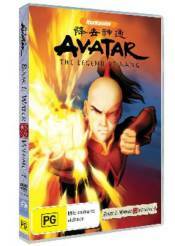 CHAPTER 16: THE DESERTER Aang begins learning firebending techniques and ends up battling Admiral Zhao. Meanwhile, Katara discovers she possesses a special power!